The latest line of Cubana flavors include Coffea Exotica and Coconut Cola. The makers of LaCroix claim they just wanted to celebrate Miami's Cuban culture with a new label — but some locals think the company's new can designs are anything but celebratory. The brand known for its colorful, flavored sparkling waters is owned by National Beverage Corp. Despite the French name most people have a hard time pronouncing (it actually translates to "the cross"), the parent company is based in Fort Lauderdale, Florida. 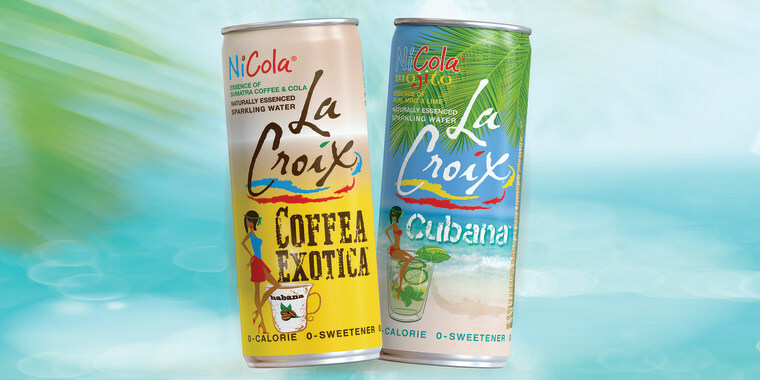 According to a National Beverage Corp. spokesperson, the latest line of sparkling waters, called Cubana Coffea Exotica and Coconut Cola, were designed to reflect the Cuban, Hispanic and South American cultures particularly present in the Miami community. "The graphics are a fun exciting way to celebrate Cuban heritage and Miami," the spokesperson told TODAY Food. "The packaging is bright and its nostalgic." The drinks have been in development for several years and were tested throughout various markets and at the Miami Seed Festival in November 2018. With mostly positive feedback to the Cubana flavors, National Beverage Corp. is moving forward with the launch. The flavors are currently available in the St. Louis market and will soon roll out in other Midwestern cities — expanding "organically" from that point on, the spokesperson told TODAY Food. Despite the product being in local test markets for several months, JennyLee Molina, a public relations and creative marketing professional, who also operates the Miami-centric Instagram account, 305cafecito, wrote a post that described La Croix's branding as "insulting" and encouraged followers for feedback. "Can we all agree that the cheesy depiction of Cuba and our heritage by people who don’t understand the U.S. Hispanic culture is a little insulting? This is a brand known for impeccable design and branding which we REALLY love but when they launched this product they completely missed the mark," 305cafecito posted. "Was this designed in 1996? These fonts are hurting our eyes, @lacroixwater. And what’s with the bikini-clad girl? You can do better than that! And what is “coffea?” Agree, disagree? Have you tasted it?" The post received dozens of supportive comments from followers agreeing that the logos and names of the new cans are "dated," "tacky" and "cringy." "It's feeding into every stereotype," one person commented. "Again, I really love @lacroixwater and actually would be really into a non-alcoholic water that tastes like a mojito, but the imagery makes my eyes roll." The National Beverage Corp. spokesperson told TODAY Food the company was "a little taken aback" by this negative post, seeing as it had been met without criticism after surveying and sampling close to 35,000 beverages to individuals, many of whom lived in Cuban-American communities. The spokesperson also alleged that the Instagram account holder was someone who had interviewed to "potentially be involved in the launch [of the new sparkling water line]," but wasn't hired. LaCroix intends to continue with the planned launch of the new drinks regardless of this negative social media post. The Coffea Exotica flavor is infused with the "essence of Sumatra coffee and cola" while the Cubana flavor is similar to an alcohol-free Mojito.